Tora je ja bolish bhai, amar ghorar dim chai – তোরা যে যা বলিস ভাই আমার ঘোড়ার ডিম চাই! The phrase “mare’s nest” is not used a lot these days. This is in contrast to the equivalent in Bengali, “asvadimba” (অশ্বডিম্ব) or “ghorar dim” (ঘোড়ার ডিম) which are both still commonly used to express disbelief at nonsense or fraud. 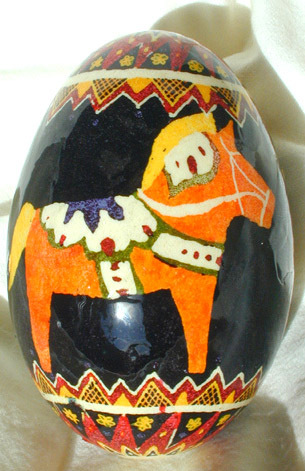 A more direct translation into English gives us something like “horse-egg.” Well, I searched for the proverbial egg and found that it is a common motif in pysanka, a type of Ukranian Easter egg decoration that relies on writing with wax. In parts of Eastern Europe, the horse is popular because it symbolizes both strength and prosperity. In fact there are quite a few pictures of “horse-eggs” on the internet including one that is quite intricate. With Christmas just around the corner, I’ve decided that I want a “ghorar dim,” and not just any will do. I want a stallion breaking out of an egg on a sweatshirt. If anyone wants to give one to me as a gift, I can tell you that you’ll find one online here. © Bhalomanush. All content is copyright and may not be used without permission. This entry was posted in আশ্চর্য তথ্য, বাংলা, Bengali, Trivia by Anirban. Bookmark the permalink. I read your Ghorardim.It is used in Indian Literatures now and then.It is a proverbial word.Like this word is Dumurerfool but usage is different. We have to search for Ghorardim life long. would be thankful if you could reply or recognize my recommendations to make this website more content focused .